Last Saturday was a beautiful warm spring day and though there was plenty of snow left, it was melting fast. The “plenty of snow” part of things is what dictates where I can go in winter because many parking areas have been plowed in or not plowed at all. Not only that but many places don’t see much foot traffic in winter so the snow hasn’t been packed down. 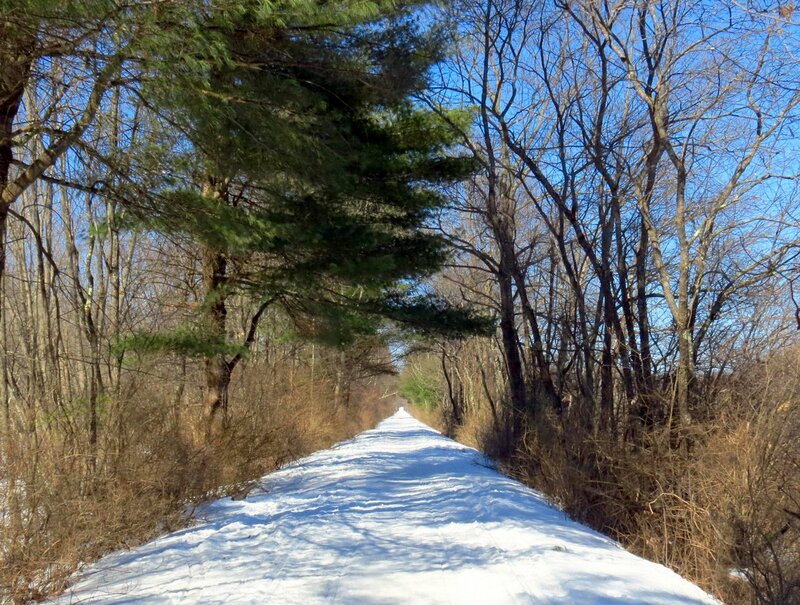 This rail trail in Keene solves all of those problems and that’s why I chose it. 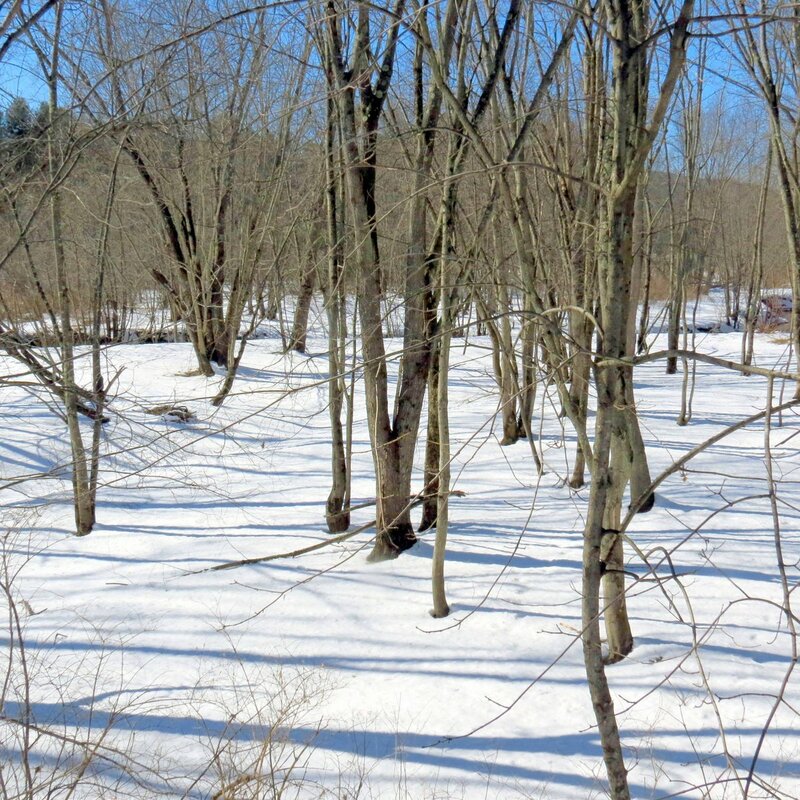 There is plenty of parking space and the snow has been packed down by snowmobiles, making it easy to walk on. If you step off that packed trail though, you could find yourself knee deep in snow, so you have to keep that in mind. 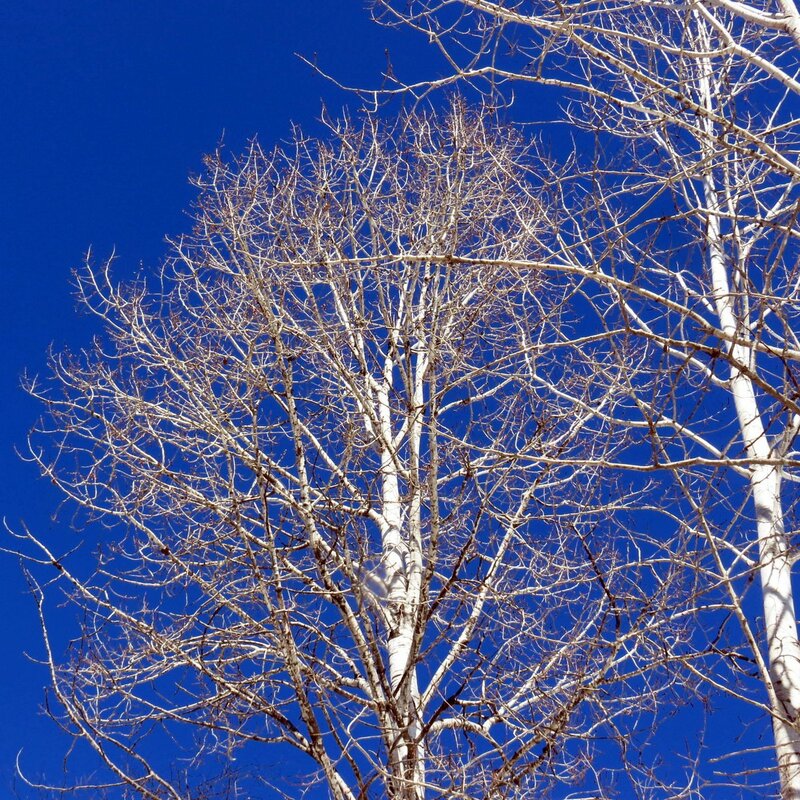 I admired the branch structure of the trees against the beautiful blue of the sky. This one is a white poplar (Populus alba,) which is a weak tree that often loses large limbs. In ancient Rome this tree was called Arbour populi, which means tree of the people. These days it is also called silver leaved poplar. It originally came to the U.S. from Europe in 1748 and obviously liked it here because now it can be found in almost every state. It is very common here in New Hampshire and is considered a weed tree. One of the easiest ways of identifying white poplar is by its diamond shaped lenticels, which are dark against the whitish bark. 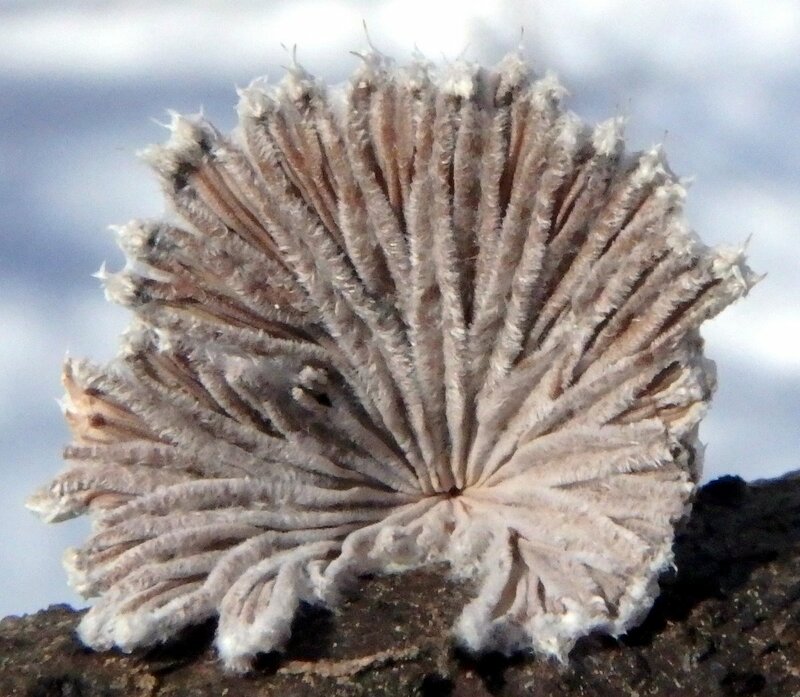 Another way is by its leaves, which are green on top and white and wooly underneath. The tree has a shallow root system and suckers aggressively from the roots, so it is best not to use it as an ornamental. 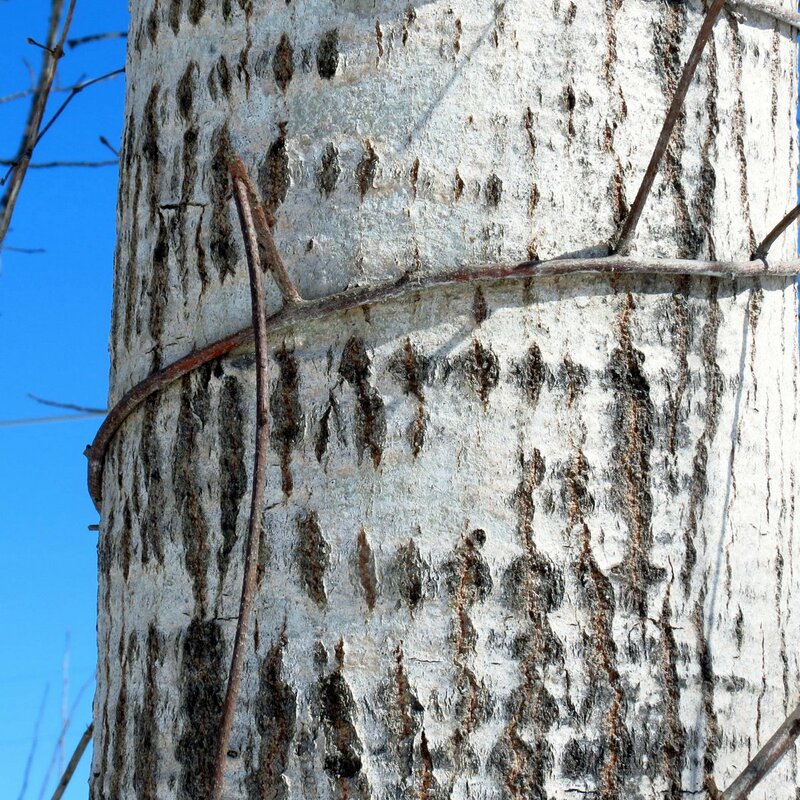 The native tree population in the area is mostly maple, pine, birch, and black cherry. This forest is young; I can remember when it was a cornfield, and knowing I’m older than the trees makes me feel a little strange. I can’t remember exactly when they stopped farming this land but if I go by the size of the tree trunks it couldn’t have been more than 25 or 30 years ago. I finally saw birds eating birch seeds. 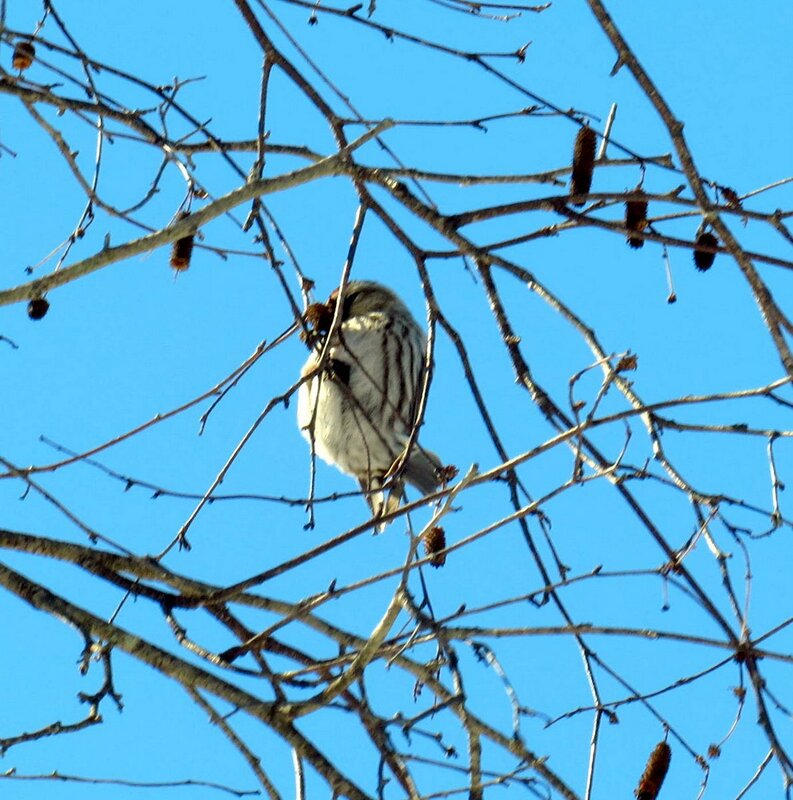 This gray birch had a whole flock of them in it and they let me stand 5 feet away and watch them feed until a snowmobile came along and scared them away. These aren’t good photos at all but I wanted to show that I wasn’t imagining things when I say that birds eat birch seeds. I tried looking these small birds up and the closest I could come was the black and white warbler, because of the stripes you can see in this poor shot. There was a resounding chorus of birdsong all along this trail on this day and now I know who was singing at least part of it. How could someone not be happy when so many birds are? The whole of both sides of this trail are lined with American hazelnut bushes (Corylus americana) and I like the way the green-gold catkins shine in the spring sun. I looked several time for signs of them opening, but not yet. When they open there will be a single bright, yellow-green, male flower peeking out from under those diamond shaped bud scales. As I was taking photos of these sapsucker holes I could hear a woodpecker drilling off in the distance. Yellow bellied sapsuckers are in the woodpecker family but unlike other woodpeckers they feed on sap instead of insects. 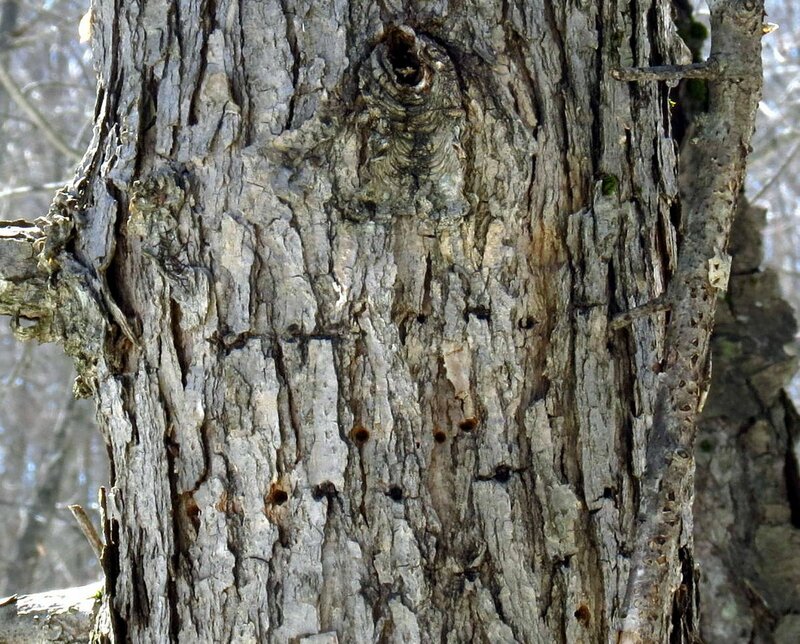 They drill a series of holes in a line across the bark and then move up or down and drill another series of holes before moving again, and the end result is usually a rectangular pattern of holes in the bark. They’ll return to these holes again and again to feed on the dripping sap. Many small animals, bats, birds and insects also drink from them, so these little birds helps out a lot of their forest companions. 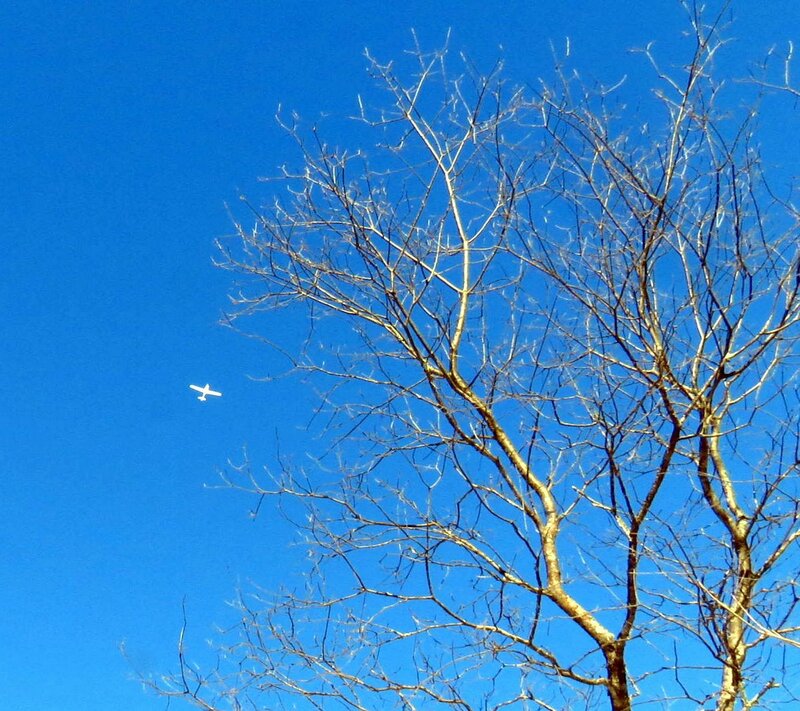 I was admiring the sunshine on black cherry branches (Prunus serotina) when a plane flew by. A single engine Cessna practicing stalls, I think. It flew in a nose up attitude and was surprisingly quiet. This black cherry had a bad case of black knot disease, which is what caused the growth seen here. 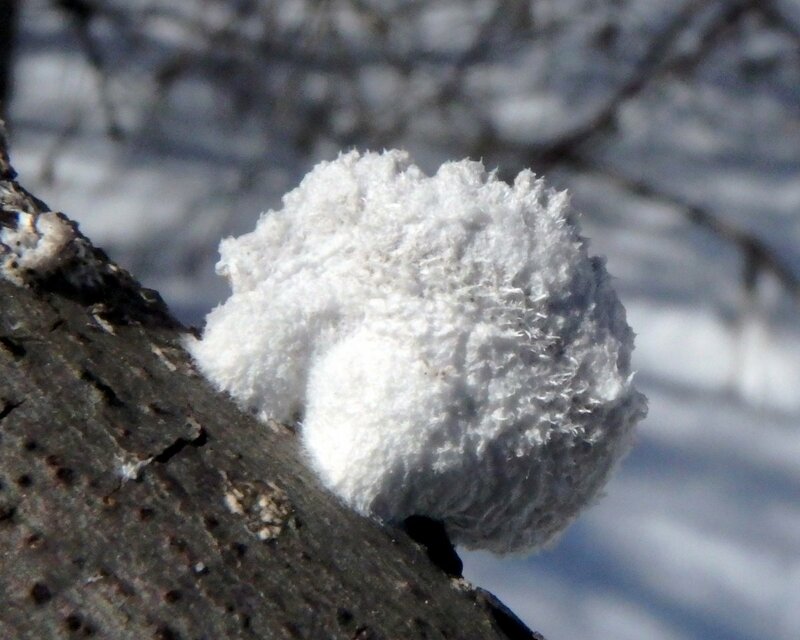 Though it looks like a burl it is not; it’s caused by a fungus called Apiosporina morbosa. When it rains the fungus releases spores that are carried by the wind to other trees and almost every cherry along this trail had the disease, which is always fatal if it isn’t cut out of the tree when it’s young. It also infects plum and other ornamental cherry trees. 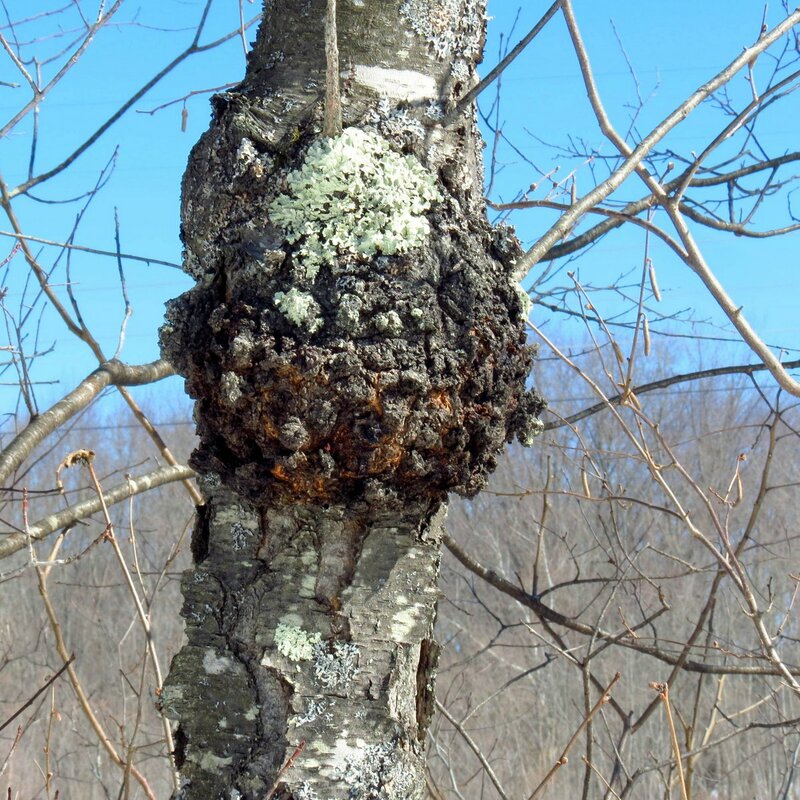 It’s often mistaken for the chaga mushroom but that fungus doesn’t grow on cherry trees. Note the tree’s platy, dark gray bark with horizontal lenticels. Black cherries can grow to 80 feet tall and 2 to 3 feet in diameter if they aren’t attacked by black knot. 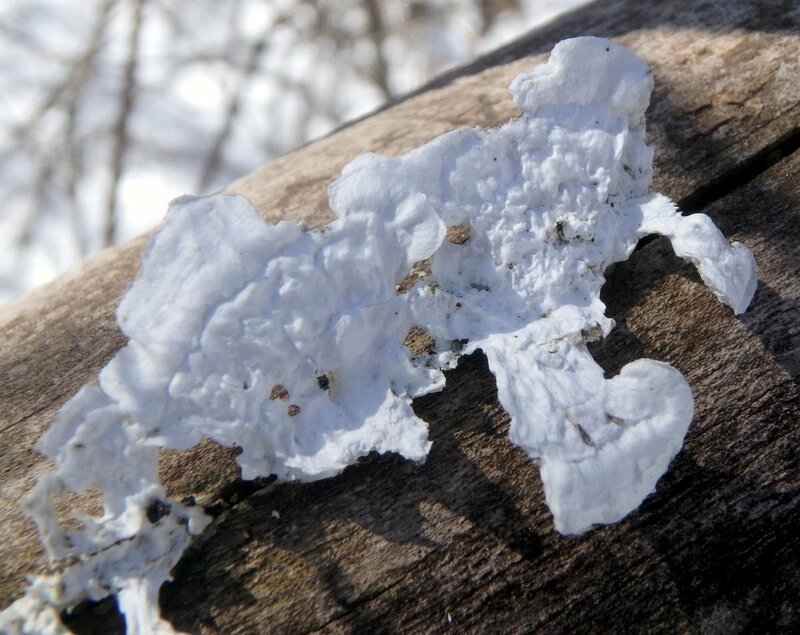 I saw what I thought was snow on a fallen branch but it was a bracket fungus that had degraded so badly it had become paper thin and the purest white. I reached the point where ash swamp brook meets the Ashuelot River and there were two small black and white ducks here, splashing across the water very fast; so fast I couldn’t get a shot of them. They were probably half the size of a mallard with dark and light colored bodies and they could really move. I used to come here as a boy and watch the bank swallows that lived in this embankment. That’s all soil, probably 10 feet deep, from the brook to the top, all deposited as river silt over who knows how many thousands of years and soft enough for the birds to dig in. It’s no wonder farmers have farmed this land for centuries. “Rich bottom land” I believe they call it. The brook and river still flood to this day, and you can usually see huge plates of ice all around the trees in this area in winter, but I didn’t see any on this day. I was able to climb / slide down the hill into the forest to get a shot of the trestle I stood on to take the previous 3 shots. 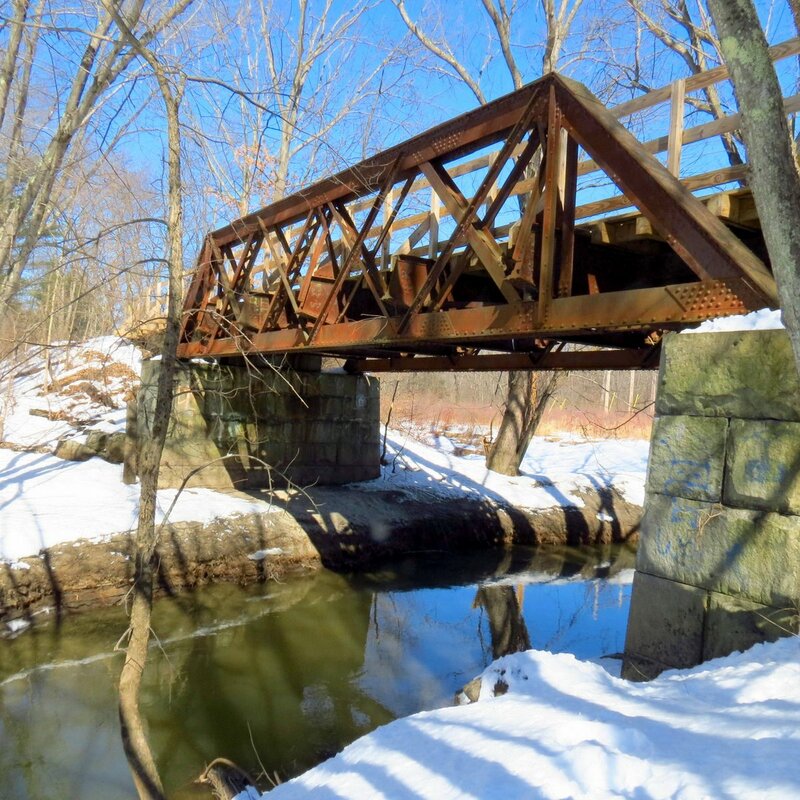 This trestle is known as a “double intersection Warren pony truss bridge” and was probably built around 1900. It is also described as a lattice truss. 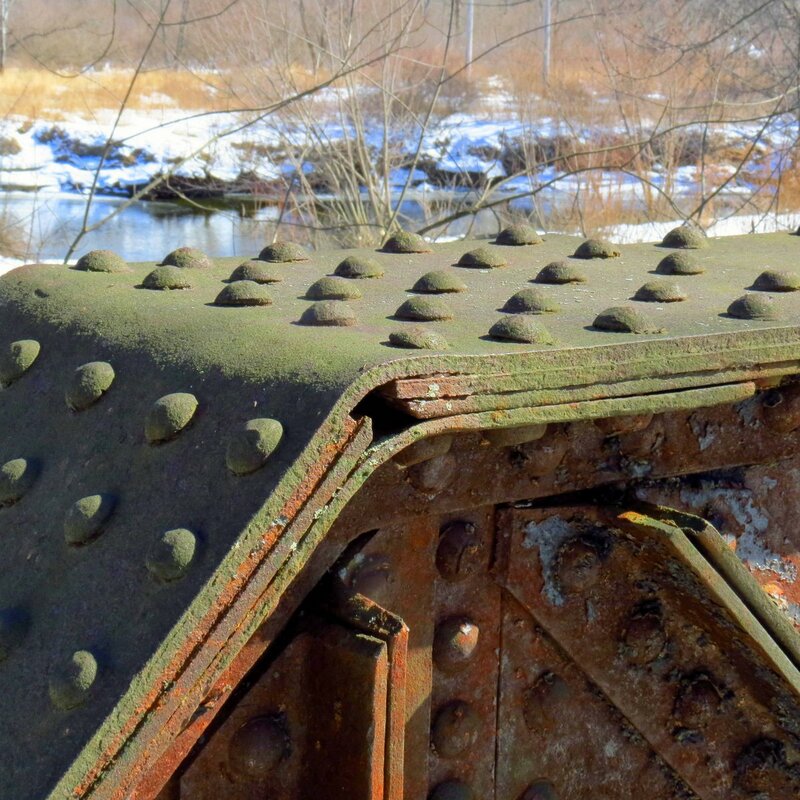 Metal truss bridges were used as early as 1866 but railroads didn’t begin using them until around 1870. By 1900 they were common and replaced wooden bridges, which occasionally burned and often were washed away in flooding. I’ve seen water almost up to the bottom of this one and that’s a scary sight. Some of these old Boston and Maine Railroad trestles have been here for 150 years and if man leaves them alone I’d bet that they’ll be here for another 150 years. I wish I knew if they were built here or built off site and shipped here. I do know that the abutments were built here from local granite, all without a drop of mortar. 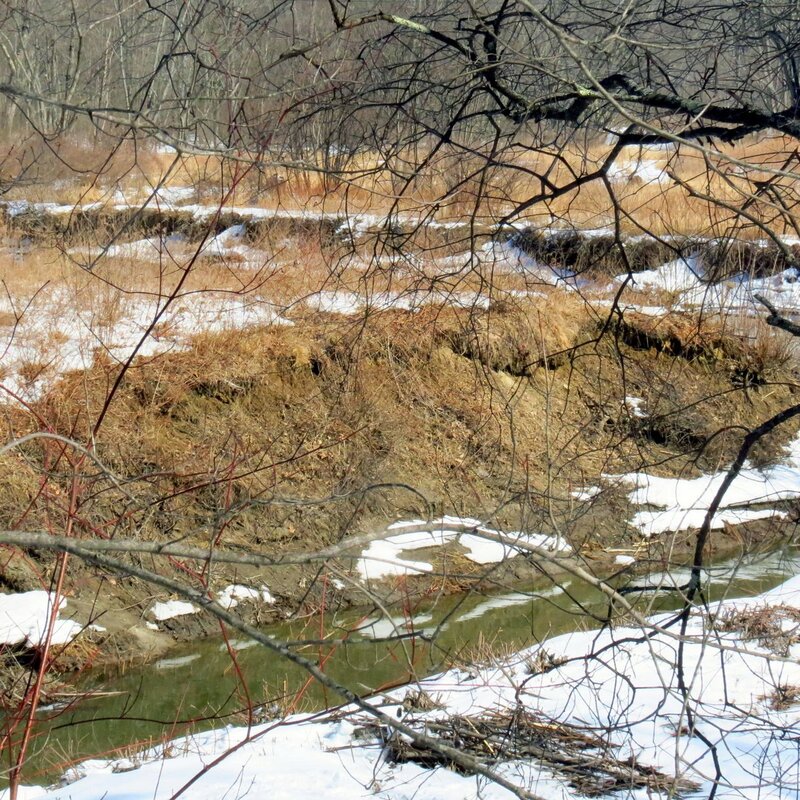 Ash swamp brook was very low but since it hasn’t rained and no snow had melted for a week or so I wasn’t surprised. 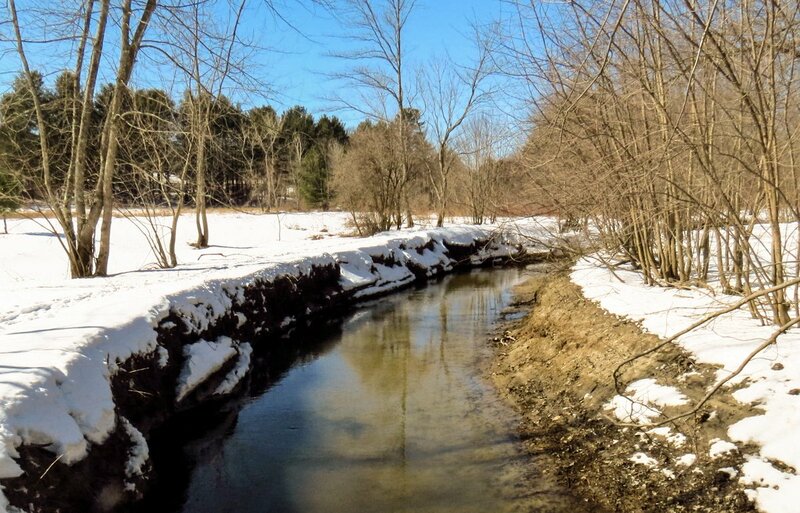 This brook meanders through parts of Keene and Swanzey and originates to the north of Keene. Hurricane brook starts it all near a place called Stearn’s hill. It becomes white brook for a while before emptying into black brook. Black brook in turn empties into Ash Swamp, and the outflow from the swamp is called ash swamp brook. 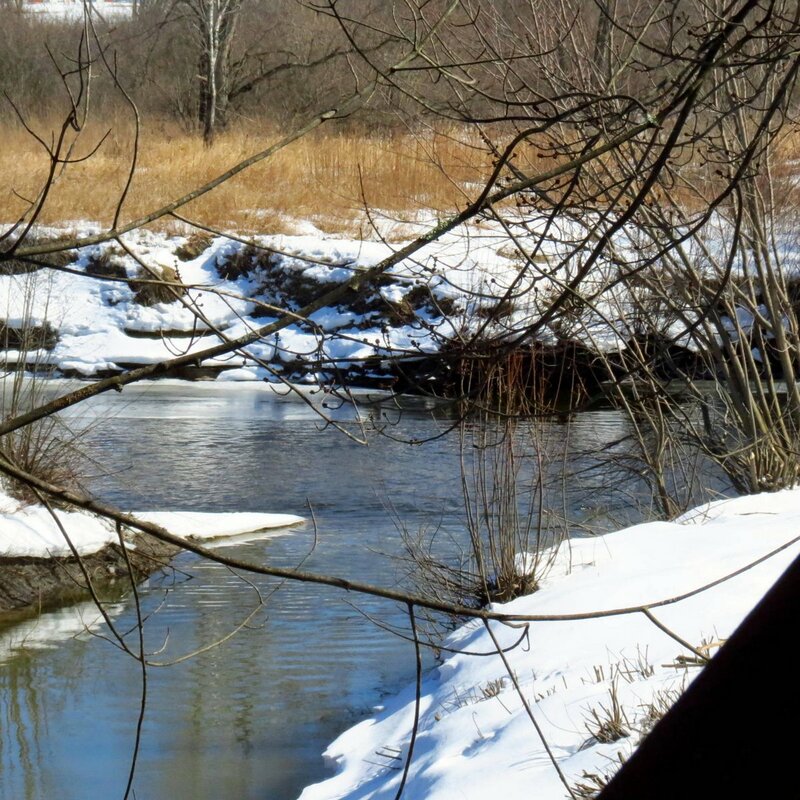 It finally meets the Ashuelot river at this spot after changing names at least 4 and maybe more times. I’m guessing all the different names are from the early settlers, who most likely didn’t know they were looking at the same brook. It’s quite long and I doubt anyone has ever followed it from here to its source. I saw a small oak branch that was full of split gill fungi (Schizophyllum commune.) These are winter fungi that in late fall and I was happy to see them because I’ve been looking for them all winter but hadn’t seen any. They are about the size of a penny and are very tough and leathery. Split gill fungi wear a wooly fur coat and this makes then easy to identify. Split gills grow on every continent except Antarctica and are said to be the most studied mushroom on earth. Scientists have isolated a compound in them that is said to inhibit the HIV-1 virus. The “gills” on the split gill fungus are actually folds of tissue on its underside that split lengthwise when the mushroom dries out. The splits close over the fertile spore producing surfaces in dry weather and open to release the spores when they’re rehydrated by rain. It’s a pretty little mushroom, in my opinion. I hate to see that black knot disease. I planted some Prunus virginiana here despite the risk. I’ve heard if you prune it out as soon as you see it and get the infected branches far away from the tree it can survive for many years, but since I’ve never tried it myself I don’t know for sure. It certainly couldn’t hurt. 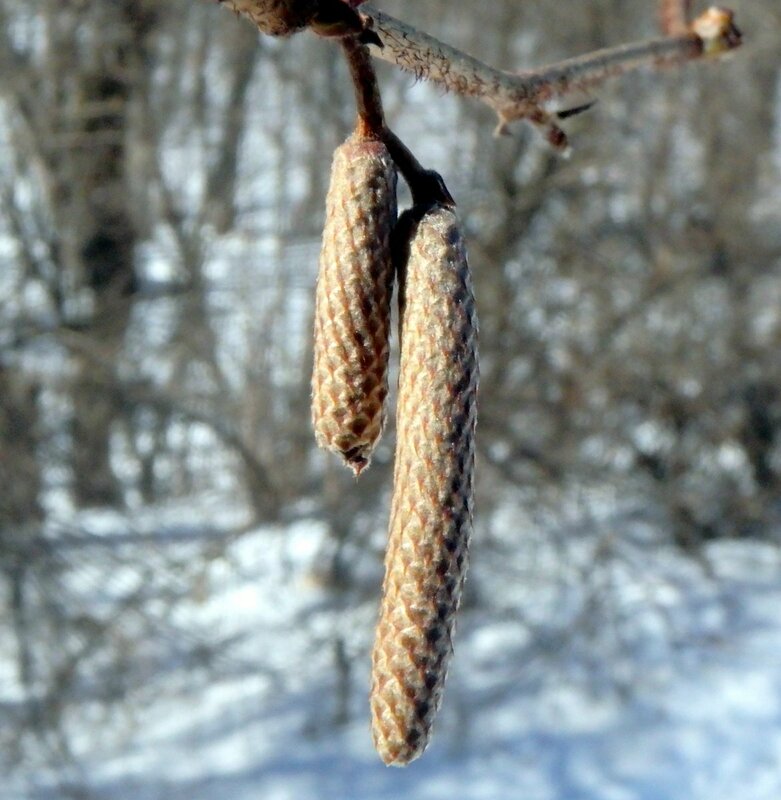 White poplar looks a lot like white /paper birch, from these pix. Are they? No, they look white from a distance but they’re actually a grayish color and the bark doesn’t peel. Isn’t it wonderful to have a nice day like that again! It sure is. May there be many more, on both ends of the country! What beautiful blue sky you had on your walk! 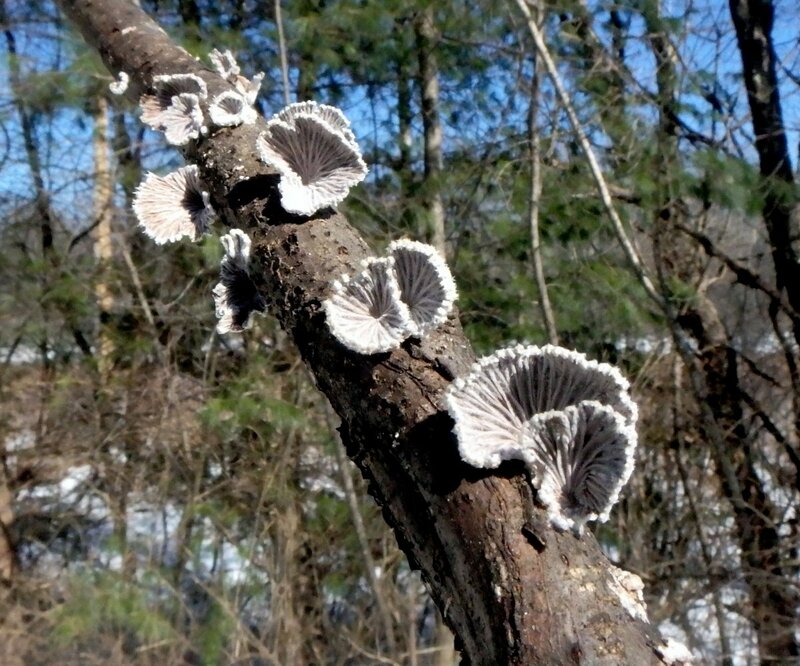 Those split gill fungi are works of art! Thank you Clare. It was a beautiful day and seeing those split gills was the icing on the cake! That is a very interesting shot of the bridge construction. It has lasted very well for its 150 years. They’re very well made with thick plates of steel. Older than the trees! Yes, that could give a person a funny feeling. Lovely pictures of the advent of spring. Thanks Laurie, it is an odd feeling! Nice post, Allen…what a beautiful pre-Spring day…. Thank you Scott. It was a beautiful day for a walk. 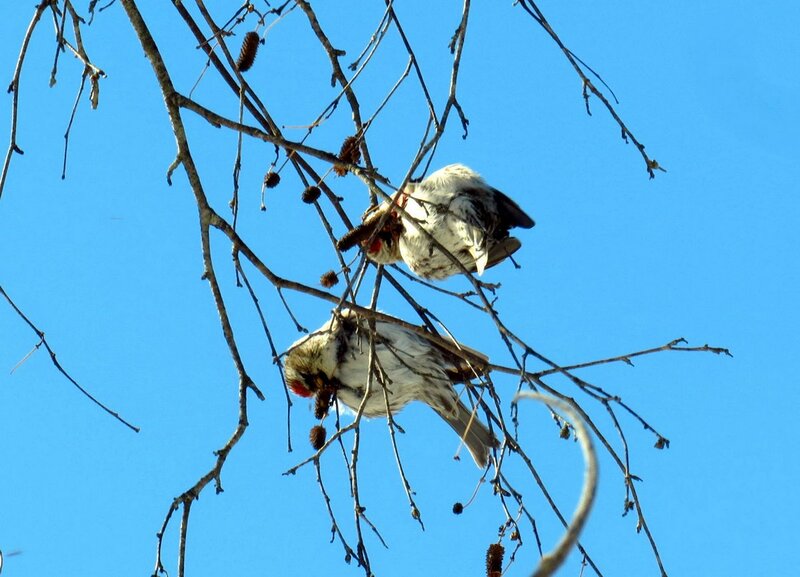 Judging from the red atop their heads, I’d guess your feeding birds are redpolls. The males are likely to have a pinkish tinge to their bellies, so these may be females. Thanks very much Sue. I’m colorblind and didn’t see any red, so I’ll take your word for it. Colorblindness is why I learned at an early age not to trust my eyes when it came to birds! I agree with Sue – I think you found some Common Redpolls! We enjoy following along with all of your walks! Thanks so much for continuing to share. You’re welcome Cheri, and thank you. I’m not very good with bird identification so I’m always thankful for help. Lovely quote too. It made me smile. Some of your photos almost brought tears. Thank you Ben. I hope they were tears of joy! If people feel beauty and love when they read these posts I can’t ask for more, because that’s what I try to put into them. Well, I’m just a sensitive soul and it seems not aloneeither. I liked those pictures of the white poplars at the top of your post, lots of other things to enjoy as well. Thank you Susan. The sunshine helped.